The all-holiday radio format isn't just popular, but extremely lucrative for stations that make the switch. NEW YORK (MainStreet) -- There are millions of reasons why radio stations in your area drill Burl Ives' Have A Holly Jolly Christmas into your head dozens of times per hour and are making Christmas come a bit earlier each year. Last year, 19 radio stations nationwide switched to the all-holiday format by Nov. 9, with WSMM 102.3 FM in South Bend, Ind., leading the charge Oct. 18. This year, 23 stations have already begun assaulting listeners' senses with Brenda Lee's Rockin' Around The Christmas Tree, which Mediabase says was played 19,406 times last year, and Mariah Carey's All I Want For Christmas Is You (19,153 times). Atlantic City, N.J.-based WEZW 93.1 FM started spreading the wall-to-wall holiday cheer Oct. 17. Gary Fisher, president and owner of WEZW parent company Equity Communications, told The Street that the switch is playing well with listeners and advertisers in South Jersey. "The 2011 economy in South Jersey has remained challenging for our listeners and our advertisers," Fisher said in a statement before the switch. "Our goal is to help brighten everyone's mood with a little holiday cheer." Holiday radio's biggest punchbowl of seasonal cheer is reserved for the all-holiday stations and their ownership groups, which have been getting a little bit extra in their mugs each holiday after radio research firm Arbitron ( ARB went to its Personal People Meter method of ratings data collection in 2007. Arbitron's ratings team began carrying around cellphone-sized monitors that could pick up broadcasts its carriers were hearing and detect the watermark of the station playing in the background, so when a listener is at the mall being elbowed in the face for the last Holiday Barbie and hears Andy Williams' Most Wonderful Time of The Year, it counts toward the ratings. Sean Ross, executive editor or music and programming for Radio-Info.com, says those PPM numbers are the biggest reason the all-holiday format won't melt away this year or anytime soon. "As PPM rolled out, there were some concerns in the industry that there might be diminishing returns," says Sean Ross, executive editor or music and programming for Radio-Info.com. "Then Arbitron unveiled the PPM book and suddenly holiday stations had the sort of numbers that hadn't been seen in a fragmented industry for 30 years." Disgruntled Grinches among the listener base can grouse all they'd like about the unceasing carols, but the biggest reason stations and their parent companies embrace the all-holiday format is because most listeners love it. Back in 2009, a 33-market study by Arbitron found that the average market share for radio stations that switched to the all-holiday format rose 91%. Last December, Entcom's KOIT 96.5 FM in San Francisco and Clear Channel's WASH 97.1 FM in Washington, D.C., WLTW 106.7 FM in New York City, WLIT 93.9 FM in Chicago and KODA 99.1 FM in Houston all saw their all-holiday ratings jump from holiday 2009. Arbitron also notes that shared listening among parents and children jumps when their radio station goes all-holiday, giving the radio stations the young demographics they covet and advertisers the parental holiday spending they crave. Last year, the number of fathers listening to stations with small children Monday through Friday jumped 60% once their station went all-holiday, while the number of dads listening to those stations with teenagers jumped 56% during the same span. Mothers get a similar bump, as more young kids (42%) and teens (37%) are likely to tolerate their radio station when Band-Aid or Bing Crosby are getting into the holiday spirit. This puts the all-holiday stations firmly onto sponsors' "nice" list for the season. Clear Channel -- which has already decked the halls at its stations in Detroit, St. Louis, Birmingham, Ala., and Columbus and Dayton, Ohio, this year -- boosted its radio revenue by $71 million (10%) in the fourth quarter of last year from the same period in 2009 behind greater local and national ad revenue. 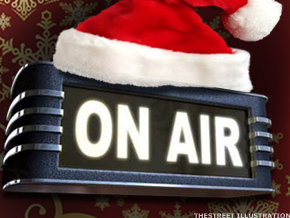 CBS Radio ( CBS - Get Report) saw last year's holiday ad revenue grow 14% from 2009 behind increased holiday spending. In each case, the station that makes the switch is usually an adult-contemporary music station that could either use the boost or can transition back to its base of Adele and OneRepublic dental-office tunes pretty quickly once Dec. 26 rolls around. "There are always concerns about how long it takes for an adult contemporary station to get back to its normal usage, but they're pretty well drowned out by the positives," Ross says. "Successful adult-contemporary stations, the ones posting those sort of 1970-level numbers, figure they have the wiggle room; less-entrenched AC stations do it because it's the only time of the year they can count on being successful." If there's any fault to the all-holiday format beyond multiple spins of Hall & Oates' Jingle Bell Rock or myriad selections from the new Justin Bieber holiday album, it's that the stations that adopt it aren't spreading enough holiday cheer. According to Andrew Forsyth, a consultant for Nielsen BDSRadio, the average playlist size for all-holiday stations in New York, Chicago, San Francisco, Dallas/Fort Worth and Los Angeles shrunk from 752 songs to 694, while the average number of times each song was played during the holiday season rose from 30.5 to 33.4. WEZW's playlist sits at little more than 500 songs whose rotation changes based on user votes. South Jersey will be getting lot more of Burl Ives' singing snowman from Rudolph The Red-Nosed Reindeer belting out Have A Holly Jolly Christmas -- which was already played 19,600 times last year and is the most-played holiday song in America -- but doesn't necessarily have to take it. "We feel that most of the music has not been played for 10 months of the year, so highlighting this genre exclusively for two months is not overkill," Equity Communications' Fisher says. "The song rotations change every week based upon emails we receive at our Web site about what songs listeners want to hear more of (and less of). Grandma Got Run Over by a Reindeer is sinking fast in the poll."